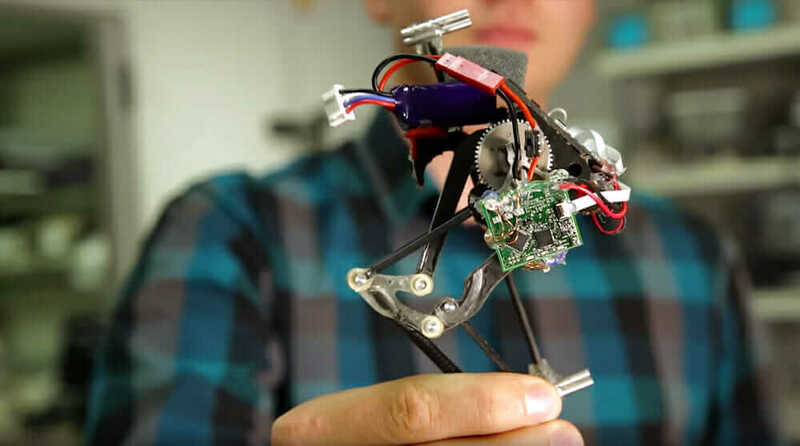 When you are trying to make a robot that can leap higher than any other, it makes sense to look to jumping animals—they’re built for the task. In the case of the Salto (for saltatorial locomotion on terrain obstacles), its parkour skills are inspired by the galago, better known as a bushbaby. UC Berkeley’s jumping robot, Salto. Courtesy Stephen McNally/UC Berkeley. Engineers from UC Berkeley have built a robot that replicates the galago’s ability to store energy in its tendons, allowing it to jump multiple times without resetting. To accurately test the robot’s jumping ability, researchers developed a new metric for measuring vertical agility, defined as the height that something can reach with a single jump in Earth gravity multiplied by the frequency at which that jump can be made. “Developing a metric to easily measure vertical agility was key to Salto’s design because it allowed us to rank animals by their jumping agility and then identify a species for inspiration,” said Duncan Haldane, a robotics PhD candidate at UC Berkeley, who led the work. For reference, Salto’s robotic vertical jumping agility is 1.75 meters per second, which is higher than the vertical jumping agility of a bullfrog at 1.71 meters per second, but short of the vertical jumping agility of the galago at 2.24. Salto weighs only 100 grams (3.5 ounces), is 26 centimeters (10.2 inches) tall when fully extended, and can jump up to one meter. For its wall jump, Salto attained an average height gain of approximately 1.21 meters (3.97 ft). The galago achieves its leaping ability through natural power modulation, being able to increase the peak power available for jumping by using its muscles to store energy in its tendons when in a crouched position. This allows for jumps higher than possible through muscles alone—and for as many as five jumps in four seconds—and a combined height of 8.5 meters (27.9 feet). Salto achieved 78 percent of the vertical jumping agility of a galago. 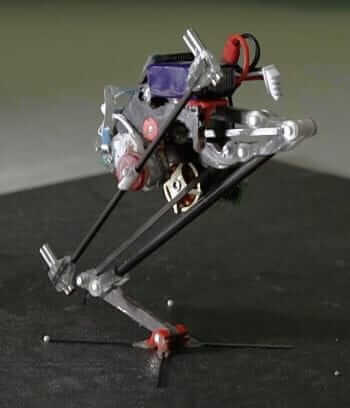 Because of motor power limits, the best untethered robot before Salto had a vertical jumping agility of only 55 percent of a galago, according to the researchers. Salto can jump vertically at a rate of 1.75 meters per second. Courtesy Stephen McNally/UC Berkeley. “By combining biologically inspired design principles with improved engineering technology, matching the agile performance of animals may not be that far off,” said Ronald Fearing, a professor of electrical engineering and computer sciences. It would be interesting to see how other jumping robots measure up to Salto using this new vertical agility metric. Robots such as TAUB from Tel Aviv University or Boston Dynamic’s SandFlea are both strong contenders for robot jumping records, showing impressive single-jump heights. The team’s research was published in the debut edition of the journal Science Robotics. It was supported by the U.S. Army Research Laboratory under the Micro Autonomous Systems and Technology Collaborative Technology Alliance, and by the National Science Foundation. Article by Shane Laros. This article originally appeared on Engineering.com.